US District Judge Beryl Howell harshly condemned North Korea for “barbaric mistreatment” of Warmbier in agreeing with his family that the isolated nation should be held liable for his death last year. 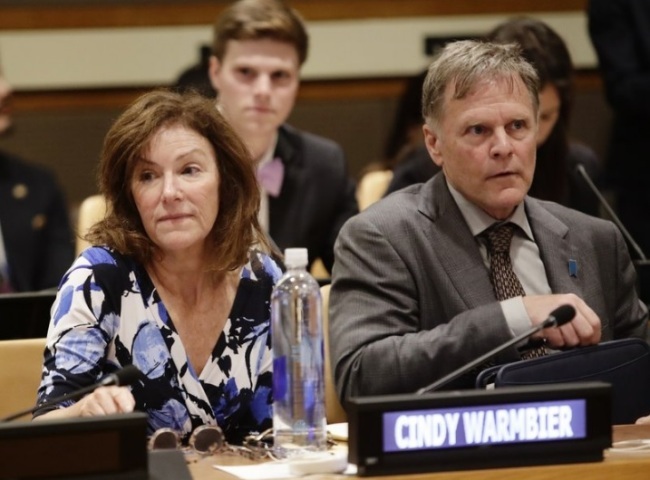 She awarded punitive damages and payments covering medical expenses, economic loss and pain and suffering to Fred and Cindy Warmbier, who alleged that their son had been held hostage and tortured. Warmbier was a University of Virginia student who was visiting North Korea with a tour group when he was arrested and sentenced to 15 years of hard labor in March 2016 on suspicion of stealing a propaganda poster. He died in June 2017, shortly after he returned to the US in a coma and showing apparent signs of torture while in custody. The arrest and death of Warmbier came during a time of heightened tension between the US and North Korea over the country’s nuclear weapons program. President Donald Trump held a first-of-its-kind summit with North Korean leader Kim Jong Un in June 2018 and plans another next year. When his parents boarded a plane to see him upon arrival in the US, they were “stunned to see his condition,” court documents say. The 22-year-old was blind and deaf, his arms were curled and mangled and he was jerking violently and howling, completely unresponsive to his family’s attempts to comfort him. His once straight teeth were misaligned, and he had an unexplained scarred on his foot. An expert said in court papers that the injuries suggested he had been tortured with electric shock. North Korea has denied that Warmbier was tortured and has said he contracted botulism in custody, though medical experts said there was no evidence of that. Though foreign nations are generally immune from being sued in US courts, Howell cited several exceptions that she said allowed the case to move forward and for her to hold North Korea liable. Those include the fact that North Korea has been designated by the US as a sponsor of terrorism, that the Warmbiers are US citizens and that North Koreans’ conduct amounts to torture and hostage taking. The penalty awarded by Howell to the Warmbiers and to Otto Warmbier’s estate includes punitive damages as well as damages for economic losses, pain and suffering and medical expenses.